The weather is always hot and humid in the summer, peaking at 40°C are extremely rare, and very mild in the winter, averaging 25 degrees and minimum of 19 degrees. During July, August and November the probability of rain is greater. The municipality contains the 1,151 hectares (2,840 acres) Pau-Brasil Ecological Station, a full protected conservation unit created in 1997 to protect a fragment of Atlantic Forest, and specifically to protect Brazil wood (Pau Brasil, Caesalpinia echinata). It contains the 894 hectares (2,210 acres) Rio dos Frades Wildlife Refuge, created in 2007 to protect the mouth of the Frades River. The municipality also contains part of the Corumbau Marine Extractive Reserve, a protected offshore fishing area of 89,597 hectares (221,400 acres). The city is now considered one of the most important sights of Brazil, receiving tourists from the center-south of the country and countries like Argentina, Uruguay and Chile. The city and surrounding area also have some luxury hotels and hundreds of smaller hotels, as well as an airport well connected with the major brazilian towns. Apart from tourism, other important activities are agriculture (especially cashew and coconut), reforestation with eucalyptus trees, cattle, and trade and services. Historical Downtown Area The historical site in the Cidade Alta area is a National Heritage Monument put under government trust by a Federal Decree since 1973. It was one of the first towns in Brazil and played an important role during the first years of European colonization. It includes three churches and around 40 buildings (among private residential houses and public institutions), restored by the State Government for the 500th anniversary celebration of Brazilian discovery. Monte Pascoal National Park Created in 1961 to preserve the place where Brazil was discovered by Portuguese warriors. It includes swamp areas, salt marshes, river marshes and a coastline around the rocky, high and round hill, considered the first point of land to be seen by the Portuguese traveler Pedro Álvares Cabral’s crew. It extends over an area of 144.8 square kilometres (55.9 sq mi), including the Pataxó tribe’s indigenous protection land. Besides its historical importance, it also offers protection to one of the last stretches of Atlantic forest in the Northeastern area of Brazil. The area is aimed at preserving valuable woods such as Brazil wood, and still hosts many species of animals threatened by extinction, such as “collar sloth”, “black burs”, among others. 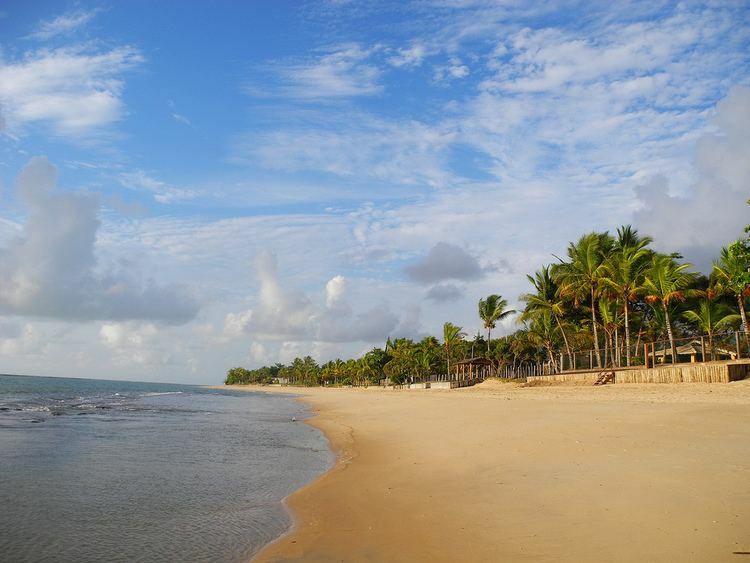 Recife de Fora Sea Park It was the first city-owned park in Brazil. During low tide, visitor can view a wide range of coral reefs, fish and many sea species. Glória Hillock Here, visitors find the ruins of what many consider to be the São Francisco Church, the where Ynaiá was buried, an Indian woman who died for the love of a crewmember of Portuguese navigator Gonçalo Coelho's fleet. People say the São Francisco Church was the first one built in Brazil, in baroque style, probably in 1504, whose ruins date to 1730. The Nossa Senhora da Penha Matrix Church Located on Pero de Campos Tourinho Square, in Cidade Alta, it was built at the end of the 18th century. It comprises an aisle, a main chapel, a sacristy and a bell tower. Jaqueira Indigenous Protection Reservation A huge jackfruit tree trunk, tumbled down by nature itself, represents the return to one’s origins and acts as a historical and cultural reference to honor the ancestral fathers and mothers of Pataxó families who recently moved into this 8.27 square kilometres (3.19 sq mi) Indian protection area. Their huts, spread around original Atlantic Forest woods, keeps original old formats, giving visitors the impression of being back 500 years in time to pre-Columbian Brazil. The Safe Port Airport (Porto Seguro Airport) was opened in 1982. Its passenger terminal was very simple and small (this building is now occupied by the Fire Department of the city). In 1997, the airport was reopened, having received a new passenger terminal, new aircraft parking lot and extension of runway to operate large aircraft. In 2010 the airport had some major renovations preparing the city to host several of the International football teams who had a training camp in Porto Seguro for the World Cup 2014. At present the airport does not host international flights.